I am so excited that Polishology has reached 300 followers! I didn't really expect this blog to become so popular when I started it, but I am so glad it has grown! You guys are awesome followers, and because of you I have basically stopped biting my nails (okay I slipped once but in my defensive that nail was already broken and coming off... haha). Thank you so much! To celebrate reaching 300 followers, I put together a giveaway for you of some of the new stuff coming out by a few of my favorite brands! I am going to split this up into two separate prizes, to increase your chances of winning. Here are the two prize packs! Now on to the rules! This giveaway will be open until Friday, February 18th CST and is open internationally. The winners will be chosen shortly after giveaway close (I will shoot for sometime that weekend but we'll see!). The first name drawn will get their top choice of prize, and the second name drawn will get the other prize. Each winner will have 72 hours from first contact to get back to me, or I will draw another name. To enter, please fill out the following entry form and post it in the comments below. Please leave all entries in one comment. That equals out to 10 possible entries! I may also throw in some extra entries for those who comment on my blog as well.. ;) I think that should about cover it... good luck and THANK YOU again for being such awesome followers! I'm looking forward to ChG Tronica bc I don't have any holos yet and I'm excited to see them irl. Oooh, pretty polishes! I love both! I'll go with #2 though considering I like the zoya and I feel like everyone will pick number one. hahaha. I'm looking forward to Tronica like Penny, I only have one holo! I follow as Aterk and my email is allison1098@aim.com. Thanks! The OPI Katy Perry collection. Unfortunately, it hasn't been released here in my country! Thank you for this huge giveway!! I love the two prices, but If I have to choose, prize 2!! I can't wait for essence holographic polishes!! i'm SO excited for nubar's new spring collection. 6. I am super excited for OPI's Texas collection - the green is the one I have been looking for all along. Hi, great giveaway, and congrats on 300 followers. awesome giveaway, please count me in! I'd go for the 1st set, although I like them both! I'm most excited about Anchors Away, the colours are so cool there! Im most excited about trying Konad!! The collection I am most looking forward to is China Glaze Tronica, I just hope I can get my hands on it! 6. I'm so excited for the China Glaze Tronica since I missed out on the OMG collection. 2. I like the second prize pack best. 6. I'm looking forward to Tronica because I work in a movie store and it would be fun to have movie themed nail lacquer! 2. I would love to win prize two. Just love the the colours in that prize. I would prefer prize #1! I'm most excited for the OPI Texas Collection! most excited for katy perry's collection, which i have yet to be able to try! I love this cute font!!! I like prize #2 because it has some of the favorite colors I want from new collections. There are two upcoming collections I'm looking forward to: Color Club's and China Glaze Tron. OK Miss Jenny - Here you go!!! 2. I want prize 1! 6. I still haven't tried Katy Perry's OPI collection and I want that black shatter!!! I follow via GFC as Justine with my GMail address and can also be reached at extemter at hotmail dot com. I would love to win Prize 2. I'm looking forward to China Glaze Crackle because it's the first crackle collection offered in the U.S. in so many different colors. +1 I would like to win prize one. +1 Follow @polishology on Twitter as @monikaretnani. +1 Post about this giveaway on my giveaway page here. +2 Include the first picture in my posting. +2 I'm most excited for OPI black shatter. I think I like #2 the best, but it was a hard decision! right nnow I am most excited about Nicole by Opi Liquid Metals collection! Hi, I'm following you as crazyforpolishes, via GFC. your blog is on my blogroll and the giveaway is in the left sidebar. I already follow you via GFC as mirr. I'd like to win prize #2. I'm looking for the China Glaze Sea Spray collection. 2. I'd love to win prize #2! 6. I'm definitely really excited for China Glaze's Anchor Away collection. There are soooo many pretties! I'm definitely excited for China Glaze's Anchor Away collection. Hi! I follow through GFC as Janna. The 1st prize is my favorite! I follow you on Twitter as nailyorkcity. The upcoming collection I am most excited about is definitely China Glaze Crackles! I would prefer prize 2. Thank you for awesome giveaway! 6. I'm excited for the CG Anchor's away collection! i'm excited about the next OPI collection...i get to go to the preview next month, i wonder what it's going to be!! 6. Most excited for ChG Crackles! I need colored CRACK! I follow you on GFC as Grape Ape. I def. like prize 1 the best. I'm looking forward to the OPI Texas collection, and since I haven't seen the ChG Anchors Away collection in stores yet, I'm looking forward to seeing that one too! I'm choosing prize 1, (even though I really want Jules, lol)! I am really looking forward to Color Club's Alter Ego collection! I'm looking forward the the China Glaze crakle polishes. I just found your blog, but I'm liking everything so far. Your layout is gorg! TY for hosting this! Both prizes are amazing, but I prefer prize 1. I also follow you on twitter as fennelbat. 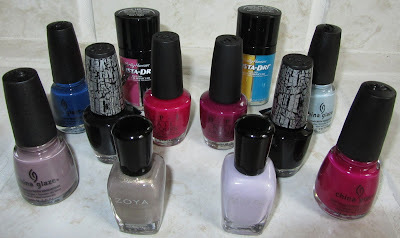 I am most looking forward to the Zoya Intimate Collection (with China Glaze's Crackle collection a close second). I follow via GFC: Sarah, walkerjs7920 at gmail dot com. Both prizes look awesome, but I'm drawn to #2. I follow via Twitter: fluffypuppynow, and tweeted here. Polishology is on my blogroll. I posted, with picture, on my Contests/Giveaways page. I'm most excited for the China Glaze Crackle collection. 2. OMG, BOTH are gorgeous and I'd be thrilled with either! So eeny, meeny, miney ... #2! 5. The ORLY Spring 2011 Precious collection looks AMAZING - there are at least 4 colors I'm lemming already! Awesome giveaway! I follow via GFC - the name is anshaffer. My email is anshaffer@aol.com. The prize I prefer is # 2. The new collection I'm most excited for is the Nubar Spring Garden collection. Hi,Jenny. I am a new follower,thru GFC. My follower name is cutie-clelicious. Right now,I am most excited about the China Glaze Crackle collection. Thank you for this awesome giveaway! Take care! I'm a GFC follower (Klahriza)and my email is rissachoy(at)gmail(dot)com. I prefer prize 1, but they are both great. The collection I'm most excited for is the China glaze Crackle glaze. This is an awesome giveaway. And congrats on +300! - I'd love the 2nd prize, "Do You Think I'm Tex-y" looks absolutely gorgeous! I'd like prize number one. I Include the first picture in my post. I'm most excited about CG Tronica and CG Crackle polishes. 3. I have you on my Google Reader, but don't know how to leave a link! Looking forward to Katy Perry Collection. Oops... forgot to say, id love the prize nro 2. Like both the prices if I have to choose I think no 1. I'm looking foward to CG Tronica, and CND perfectly bare set. This is so great- thanks for setting this up! Prefer: LOVE the first set! Most excited about OPI's Katy Perry Collection! I like both prizes, but I would choose no. 2. I follow on twitter (Alexa1202) and tweeted: http://twitter.com/#!/Alexa1202/status/32090285496340480. I'm most excited for Katy Perry and I hope she does more polishes for OPI! I am a Follower! :) My GFC name is Natalie, and my email is natalie_nielson@hotmail.com. I would LOVE to win either, but Prize One would be my first choice! I am really looking forward to China Glaze’s Tronica Collection! Holographic polishes are awesome! Hi! Thanks for an awesome giveaway! I honestly don't mind which one I got, but if I could choose, I'd get the second one. Have you seen my giveaway on my blog? This is my first giveaway, and I’m celebrating 25+ followers! http://bex-4-ever.blogspot.com/2011/01/25-followers-giveaway.html Feel free to have a look! I prefer to win prize no 1..
Congrats! I follow via GFC as BMR. Email is nailpolishcrazy@gmail.com. What spring collection am I not looking forward to? :) I think I'm looking forward to most is the Zoya Intimate collection. Or maybe the RBL Spring Collection. I want every color of both collections. looove nail polish. i would really like to win the first pack. I am most looking forward to the Crackle Glaze colors from China Glaze! Hi, I follow your blog publicly via Google Friend Connect as shala_darkstone. I'd like to win either prize pack but if I absolutely had to choose I'd say the 2nd one. I follow @polishology on Twitter (@shala_darkstone). I look forward to Katy Perry's OPI collection! I prefer to win the prize two. I'm so excited for The OPI Katy Perry collection. Prize 2 I think... Both are good. 2. I would love to win prize 1! -I can't wait to get my hands on China Glaze Anchor's Away. Tough choice, I've been lemming Sea Spray and Tex-y, but I'll go with #1. I'm looking forward to China Glaze's Crackle Collection! I'm most excited about CG Tronica. It's not as holo as OMG and Kaleidoscope, but come on, it's holo! If I would be winning, I`d pick prize nr 1. Thank you for entering me and have a great day! 2. I love both prizes but I would pick #1 because of the SH French Mani Combo - Swedish flag colors would make this a fun product to play with! 3. I am really looking forward to the China Glaze Tronica and Crackle collections! Thanks for doing such a great blog! I follow on GFC : Dalia M.
I love both prizes, If I had to choose though it would be prize 2! I can't wait for the Glee opi for sephora polishes!! Thank you so much for this oppurtunity! i would like to win prize two. i post about you (http://maybesnewstart.blogspot.com/2011/02/action-and-wonderful-giveaway.html) and you are on my sidebar (http://maybesnewstart.blogspot.com) and on blogroll. Hey, you have a lovly prizes!!!! I like prize two the best! Congrats on 400+ followers! :) Please, enter me - Blu11 (blanche.b[at]gmail[dot]com). I'd love to win Prize 1. Polishology is on my blogroll and I posted your giveaway in my sidebar (with a picture): http://polishdrop.blogspot.com. I'm excited about Zoya Intimate collection the most :). Hi! I'm Regina and I follow via GFC at dreamtofwolvesATgmail.com and twitter at dreamtofwolves). The collection I'm most excited about is the Cashmere Collection by Nails Inc. I'd also like to try some of the new sorbet/jellies from the OPI Texas collection. Oh, I love Polishology!! Great giveaway! I would like to win prize 2. My follower name is inmydamndreams (GFC) and my email is purrrpolish@hotmail.com and I would loooove prize two, because they’re more my colours haha! i look foward to Essence Whoom! Boooomm!!! How sweet of you, congrats! Follow via google friend connect as artful expression. The collection i'm most excited for is China Glaze's Crackle. i <3 crackle polishes since i was a young teenager. 6. i'm so excited about the burlesque collection (OPI) I love it! I like the 2nd prize the best. I'm looking forward to getting alot of the polishes from the China Glaze Anchors Away collection. I'm really looking forward to the ChG Crackle collection ! Thanks for entering me ! I also posted about your giveaway on my blog's giveaway page with the first picture. Right now I'm most excited about the upcoming China Glaze crackle collection. Can't wait! I follow you as Persa Karać, my email is persakarac@gmail.com I like second gift more. I will post about your giveaway on my sidebar at beautyandsweets.blogspot.com Thank you! I really like the second prize option. I've had my eye on Jules from Zoya and Black Shatter! I'd like to win the first prize more. I'm most excited about China Glaze Anchors Away collection (well, that already out, but anyways) and also China Glaze Island Escape. im excited for the nubar spring collection! I prefer the prize two, although they are both perfect. I follow as Elle and my email is tahoechocolate@gmail.com I would prefer to win prize#2, but both the prizes are really great! I am most excited for the china glaze tronica collection- I LOVE holos!!! Hi, I follow as Polishing and make-up. I have you on my blogroll, I posted about this giveaway (sidebar) on my blog: http://polishingandmakeup.blogspot.com and I included the first picture in my posting. Thank you for this great giveway! I follow as rebecca, my email is beckalesley04@hotmail.com. i'd prefer to win the first prize because it has some of my wish list polishes in it! the collection i'm most excited for right now is texas!! I would like to participate to your giveaway ! I want to win prize 1. The best new collection is OPI - Texas. Yay!! Cool giveaway!! :) I am a new follower. I'm so excited for China Glaze's Anchors Away collection! P.S.- thanks for having such a great giveaway! I would like to win prinze two!!!! I'm a follower as Giusy. my mail address is ysuig88@msn.com. on my fb page there is a link of this fantastic giveaway!!! the link is http://www.facebook.com/?ref=home#!/profile.php?id=1373325060. good luck!!! Hello! New follower here via GFC under the name Elaine. I wrote about Your giveawy : http://fashionery.blogspot.com/2011/01/rozdania.html. I am most excited for China Glaze Anchors Away collection. I follow you as Barbara . I am very excited about the upcoming crackle collection by china glaze. I'm following via GFC under nick overburdened and my email is overburdened3(at)gmail.com for prize Number Two! I'm sadly excited about Sally's getting the Katy Perry line - can't find them locally yet. *I am a follower through GFC (Megan Harmeyer). *I'd love prize #2 because I'm lemming Jules and Do You Think I'm Tex-y (horrible name OPI!). *I'm really looking forward to ChG Tronica (if it ever comes out publicly). - i'm so excited fot the OPI Katy Perry collection. Congrats on your 479 followers!! My fav is #1 (but it was a hard choice)! I'm very excited about CG Tronica, even if I know that it will be practically impossible to find it here in Europe. i'm so excited fot the OPI Katy Perry collection. I love the prize 2. I tweeted about this giveaway: http://twitter.com/#!/TaiaG/status/35373057858076672. I'm your follower via GFC as JoanneDevian. And thenks for the giveaway! They are both great prizes but I think #2 is my favorite. Congrats on 300 followers, that's awesome! And thank you for hosting such a great giveaway! I had such a hard time deciding because both are gorgeous, but i'd have to say i'd prefer prize 2!